Mad About Pets was lucky enough to try out the Neko Flies Small Kittenator, which is a wand toy for cats. Also included was a Kragonfly attachment which can switch up the Kittenator's furry mouse attachment for a little variety. 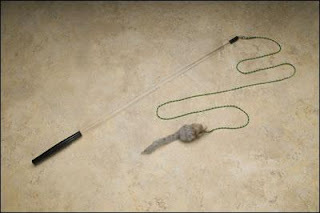 The Small Kittenator package includes the wand and realistic furry mouse that you can make scurry along the ground or fly about for your cat to chase. In my opinion, wand toys are one of the most important types of toys to include in your cat's toy-arsenal. They encourage instinctual stalking and chasing behavior, get your kitty up and active, and also allow you time to interact and bond with your cat. You may have noticed that some kitties like to play with a stationary mouse, throwing it around the room and stalking it as though it were real...yet others will stare at it as if to say "What the heck should I do with this thing?" Wand toys are the perfect solution for kitties that just don't grasp the idea of playing with a traditional mouse toy; I've yet to meet a cat who can resist a scurrying mouse or waving feather that seemingly moves on its own. In our home, we refer to it as "fishing for cats"; just throw out the line, and you're basically guaranteed to snag a cat or two. This video features our Birman named Andromeda. She is the bully and the brat of our feline trio, and she is incredibly enthusiastic about her play. Here she shows us how spastic she can get when she plays. Andromeda posed a bit of a challenge when she played with the Kittenator, as she wanted to hold onto the mouse and shred it. This is why cats should always be supervised when playing with wand toys! Well, that and the fact that they may also consume the entire string connecting the toy to the wand...﻿cats and string are a bad combination. Our next video features Gabe, the elderly gent of the household. He is well-behaved and relaxed most of the time, but when playtime comes, other cats beware--he becomes a kitten again! ﻿Here he can be seen doing a very enthusiastic barrel roll. If you look carefully, you will also see that his tail is fluffed up like a bottle brush due to the sheer excitement of "the hunt". The look he gives at about the 5 second mark of the video is positively hilarious--he looks possessed (pull the video up on YouTube and you can see it better). One would never guess he is 11 years old! Last but certainly not least is Rory. He is our shy and subdued Siamese, who often takes a backseat during group playtime due to the spirited play of his comrades. He does enjoy playing and will sometimes watch from the sidelines, but he doesn't like to get in the middle of things until the others have tired themselves out. I think he enjoys feeling like he's part of the gang, even if he doesn't always take center stage. I always make sure to give him plenty of one-on-one time when the others have zonked out for the day. I would certainly recommend Neko Flies for anyone with a cat (or several). Play is one of the most important things you can do for the well-being of your cat! Check out the full line of Neko Flies wand toys online, or look for them in a store near you! Guest Post: Are Dog Parks Dangerous? 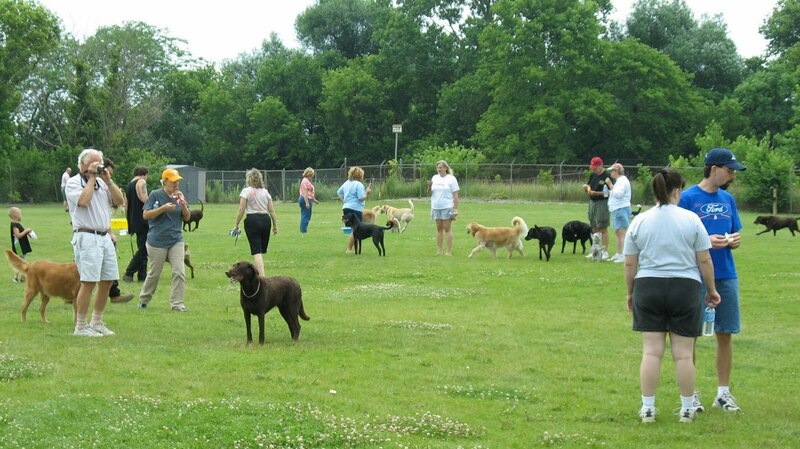 Dog parks have quickly gained popularity over the past few years. In the beginning, the standard dog park might have consisted of an open field, some sort of path, and a puddle known as the puppy pool. Oh, how things have changed. Don't be surprised to see a full blown swimming pond, jungle gyms, and even doggy showers. Watch your dog closely when they're at play. You should always be able to spot your dog. Accidents often happen with your back turned. Feel free to socialize with other dog owners—just be mindful of your dog's location in the park. Play tends to be the best form of bonding time, so be part of the action. When you're an active part of your dog's life, both of you will benefit. Put simply, Great Danes shouldn't play with Chihuahuas unless they have the same owner. Many dog parks have designated areas for different sized dogs. Use your best judgment if your dog could be in danger. Puppies often have a difficult time acclimating to new situations. They're also vulnerable to attack and to disease. Play it safe and let them socialize in more controlled settings until they reach six months of age. If your dog appears stressed, you may want to throw a leash on them and call it a day. Excessive panting, barking, and shaking are all sure signs of stress. This blog post was provided by HowToPayMyVet.com, a website dedicated to vet bill assistance. Whether you need help with vet bills for a dog, cat, or other pet, howtopaymyvet.com can provide the assistance you need to pay your bills on time. Join the cool cats! During the 29-hour adopt-a-thon, you can adopt an adult cat (6 + months) for $29. The special pricing is good at DCHS main shelter, DCHS West and Mounds Satellite Adoption Center, however only the DCHS main shelter is open the entire 29 hours. To kick-off the event, join Patricia McConnell in an informative and entertaining overview of the behavior of the felines in your family August 19 at 7:00pm. We'll explore who cats are, where they came from, and how to send them memos (in cat-speak, of course) with requests for behavioral improvements! DCHS is recommending a $5 donation at the door to attend. Please register ahead of time to secure your spot. As our Catapalooza adopt-a-thon comes to an end on Saturday, join us at 7:00 pm at Monte's Grill and Pub in Verona for a celebratory event! Band in a Box will keep the karaoke tunes spinning and there will be great prizes, food and FUN! See you Saturday night!! Ever found yourself wondering what to give as a present to a member of your family or a special friend that is obsessed with animals? Wonder no more because here are six unusual gift ideas available from companies like Wish that’ll give you some much-needed inspiration! Do your bit to help out an endangered species by adopting or sponsoring an animal of your choice. There are a whole range of different animals available, from a brown bear to an elephant, a dolphin to a penguin and a tiger to a turtle and your money will be well received by animal charities that are doing what they can to help preserve and protect a variety of species. Animal gift ideas don’t come much more unusual than the ones available through Oxfam America. For example, a donation of $18 will give rural farmers in some of the poorest countries in the world the means to make and sell their own honey, which is fair trade. These are life-changing presents with a difference. More and more people are having a photo-shoot done with their pets and it’s a great way of creating a series of special pictures that capture the close bond that exists between animals and humans. These images become even more poignant over time and can act as a perfect keepsake for years to come. One of the best hands-on approaches to getting up close and personal with a few prominent members of the animal kingdom is to have a birds of prey experience, which is extremely exhilarating. Learn about all manner of different birds and what makes them such wonderful creatures and then put on a protective glove and witness them in flight. Observing whales – or any big aquatic creature for that matter – in their natural environment is something very unique. Take to the water and watch the giants of the sea in all their glory or even get into the water and swim amongst them if you’re particularly fortunate. Either way, you’re guaranteed to be blown away by the sheer size and splendour of these magnificent animals. Zoos and safari parks have a vital role to play in conservation and educating members of the public of the plight of rare species. Shadowing a keeper will give you a fascinating insight into what must be an incredibly rewarding job. Find out what it takes to be a zoo keeper and how they go about keeping so many different animals safe and secure. This article was provided by Wish.co.uk – providers of the best experiences that can be found anywhere and everywhere in the UK. From driving days to pet photography, Wish have just about everything. Shawn R. Bierd, age 42, of Deerfield, WI has been charged with Disorderly Conduct and Mistreatment of Animals/Cause Death in Dane County Circuit Court. Bierd is accused of shooting and killing a German Wirehair Pointer named Catja after she killed one of his chickens on his property. Bierd stated that he chased down the dog and tracked it until he was able to find it, then shot the dog twice with a 20-gauge shotgun (once in the chest, and once in the head). Bierd stated to the officer investigating the matter than he "absolutely" intended to kill Catja. Bierd is scheduled for a status conference on September 12, 2011 at 1:30 p.m.
Congrats to Mad About Pet's recent contest winners! Katie M. from Taylor, MI for winning the Vet's Best Hypo-allergenic Shampoo giveaway! Thanks to all the readers who entered, and keep watching for more great contests from Mad About Pets!